Which Dividend Rules the Toy Store -- Disney, Hasbro, or Mattel? These three toy-store stocks offer unique risk-reward profiles for dividend investors. Which one suits your portfolio best? Dividend investors shouldn't overlook toys. Selling toys, licensed apparel, and video games is a mature market, which often leads to solid dividend plays. And kids everywhere are always finding new ways to pull on heartstrings and purse strings alike, powering the toy sector's big cash machines. So let's look at the top three names in this market, with dividend investments in mind. Data from Yahoo! Finance and Motley Fool CAPS. This looks like an open-and-shut case, right? Disney may be the only Dow Jones Industrial Average (DJINDICES:^DJI) stock in this trio, but it also carries the third-leanest dividend yield among the 30 blue-chip stocks. The average Dow member pays a 2.6% dividend yield, which means that both Hasbro and Mattel offer stronger payouts than the elite market index as a whole. From this perspective, either Hasbro or Mattel would be a much better dividend play than Disney. HAS Dividend data by YCharts. Hasbro's dividend outgrows its sector rivals over the last 10 years, with only a brief break in the stepladder to account for the global economic crisis in 2008. 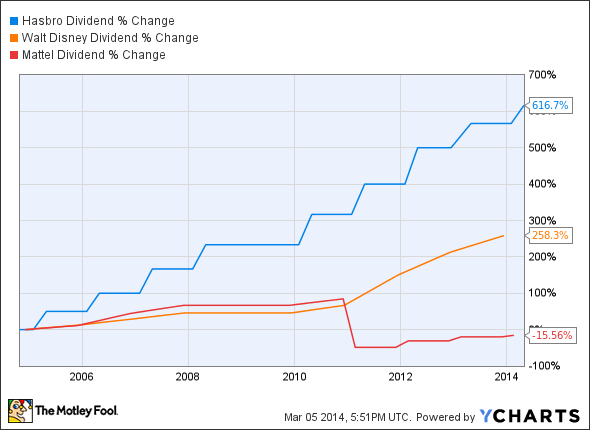 All three of these companies pumped the brakes on dividend growth that year.. Zero dividend growth once in a blue moon may not be a disaster, but Mattel went further and slashed its payout by 72% in 2011. Fellow Fool Jordan DiPietro saw it coming beforehand, because the maker of Barbie and Fisher-Price toys was fueling its 3.5% yield with an uncomfortably high 41% portion of trailing earnings. Today, Mattel is back to sky-high payout ratios, pumping 55% of its earnings back into shareholder pockets. That's identical to Hasbro's payout ratio, with the caveat that Mattel often floats in this rarefied air while Hasbro is fairly new to 50% payout ratios. What about Disney? Well, the House of Mouse only funnels 24% of earnings into dividend payments, leaving plenty of headroom for fresh payout growth. So what's the best dividend pick in the toy store? It depends on your needs and expectations from an income investment. If you want a rock-solid dividend that isn't likely to dip, Disney takes the cake. But then you'll have to settle for a much lower starting yield. This strategy makes sense for investors with a tremendously long-term strategy, who also prefer safety over high-risk, high-reward plays. If you prefer a stronger yield today with some risk of wobbly payouts later on, Hasbro would be the obvious choice. The company behind Playskool, Transformers, and My Little Pony combines a strong 3.1% yield with a proven commitment to raising payouts on a regular basis. On the downside, Hasbro's payouts are starting to run hot, perhaps forcing the company to step on the brakes again. Mattel offers the juiciest yield here, but also the largest risk. These dividends have taken a haircut before and may need another trim soon. Mattel doesn't mitigate the risk of high payout ratios with a strong track record in the way Hasbro does. So this one only makes sense if you're OK with high levels of dividend risk.